Second-tier cities with higher-than-average urban population growth are becoming fertile and viable areas for future commercial real estate investment. Often seen as an alternative to investment in the “big six” real estate markets–Boston, Chicago, Los Angeles, New York, San Francisco and Washington, D.C. — most of which are often dubbed 24-hour cities, 18-hour cities are being propelled by faster than average growth. 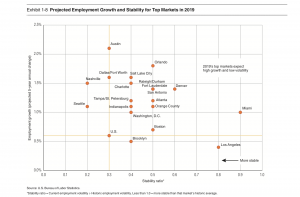 According to a recent report by PwC and the Urban Land Institute, nine of the top 10 markets and 17 of the top 20 markets with strong projected employment growth and stability fell into the category of 18-hour cities. Cities like Nashville, Orlando, Austin, Fort Lauderdale, Dallas/Fort Worth and others are surprisingly more stable due to population and employment growth. The projected average annual population growth over the next five years in these markets is 1.3% compared with 0.7% for the United States as a whole, and five-year annual employment growth is expected to reach 1.2% compared with 0.6% for the United States. 18-hour cities were also seen as faster growth markets due to lowers costs of living and setting up businesses compared with larger markets. The influx of more than 1,800 companies which left California to move to the Southwest, specifically Austin and Dallas/ Fort Worth are evidence of the dramatic shift. Portfolio managers believe there is some room to go in this cycle, especially in a potential downturn, where faster-growth markets are seen as areas where investors prefer to be. 18-hour cities are becoming more diversified by industry which is increasing investor confidence that these markets will remain protected from isolated events capable of disrupting their local economies. The report found that the increased comfort level is driving more investors to look to non-gateway markets. One of the landmark features of 18-hours cities is that they generally offer developed desirable urban neighborhoods and attractive suburban sub-markets which are likely to grow in the near future. The survey found that 18-hour markets saw an average of 55% of their new residents relocate in the suburbs over the last five years. These markets are especially attractive for retail development and office markets, as retail follows rooftops and development grows to meet the new resident requirements and residents prefer working closer to where they live.